Each year Dr. Cooley opens his namesake annual golf tournament, the Denton Cooley Tau Classic, with warm and witty comments to welcome the players. One of his lines this year, “Life without golf is like a brain without a heart,” sounds like the words of a man who has enjoyed his share of leisure time. But, in fact, Dr. Cooley is one of the world’s preeminent heart specialists, founder and president emeritus of the Texas Heart Institute, and pioneer of many techniques used in cardiovascular surgery today. 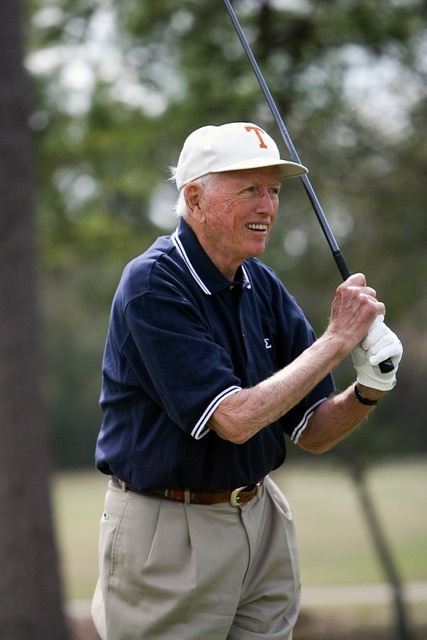 Born in Houston in 1920, Cooley, the son of a successful dentist, excelled in academics and sports throughout his school years. After high school graduation in 1937, he enrolled at the University of Texas at Austin as a pre-dental student (later switching to pre-med) and pledged Kappa Sigma. Dr. Cooley graduated from UT Austin in 1941 with highest honors and earned his medical degree from Johns Hopkins University School of Medicine in 1944. After completing his surgical training at Johns Hopkins in 1950, he moved to London to work with heart surgeon Lord Russell Brock and participated in the first intra-cardiac operation performed in England. He returned to Texas and joined the faculty of Baylor College of Medicine, serving as a professor of surgery for 18 years. He performed the first successful human heart transplant in the United States in 1968 and became the first heart surgeon to implant an artificial heart in a human in 1969. He has been awarded the Presidential Medal of Freedom, the nation’s highest civilian award; the Rene Leriche Prize, the highest honor bestowed by the International Surgical Society; the National Medal of Technology; and the Boukalev Premium, Russia’s highest award for cardiovascular surgery, bestowed by the Russian Academy of Medical Science. But even with his unparalleled accomplishments and world acclaim as a cardiologist, his Kappa Sigma roots still run deep. He has been honored as Tau Man of the Year and International Kappa Sigma Man of the Year for his many contributions to the fraternity. In recognition of his substantial donations to the previous capital campaign to build the lodge, the Chapter named the attached sports court in his honor. He has donated generously to the Tau Chapter over the years and, for the past eight years, served as host and emcee for the Denton Cooley Tau Classic golf tournament, an annual fundraiser to support rush. The esteem in which he is held at the University of Texas is visible on campus as well. The Denton A. Cooley Pavilion, a luxury training facility for the UT men’s and women’s basketball teams, was named in his honor. It is situated next to the Frank Erwin Center, named after another Kappa Sigma Tau legend. Dr. Cooley and his wife, Louise, a retired registered nurse, raised five daughters (all who attended UT and were Pi Phi’s) and have 16 grandchildren, nine who are in the medical field. Please visit our website at www.kappasigtauut.org. For more information about Tau Legacy 2015 please contact willie.madden@kappasigtauut.org.